I biked to Woods Hole at 6am this morning. 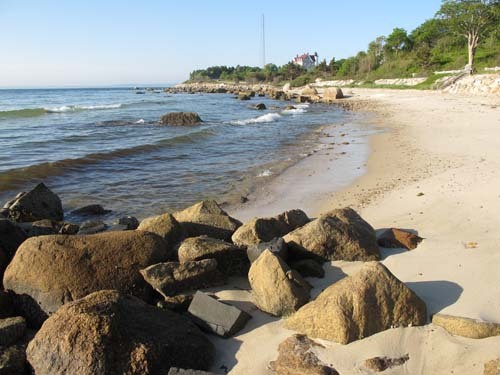 Here’s the view along Vineyard Sound, looking toward Nobska point. And then going up the hill toward the light house. 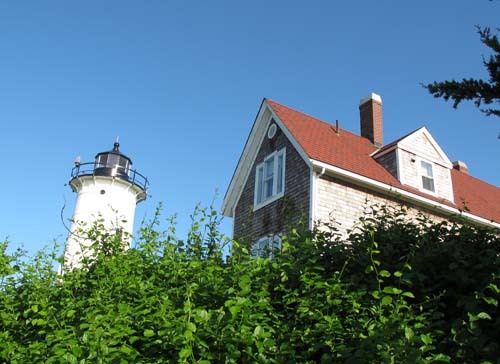 And then Nobska Lighthouse at the top! 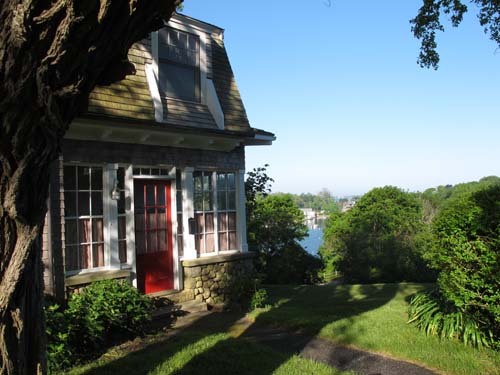 I biked further into town, past this charming house, which overlooks Little Harbor. What a beautiful day! 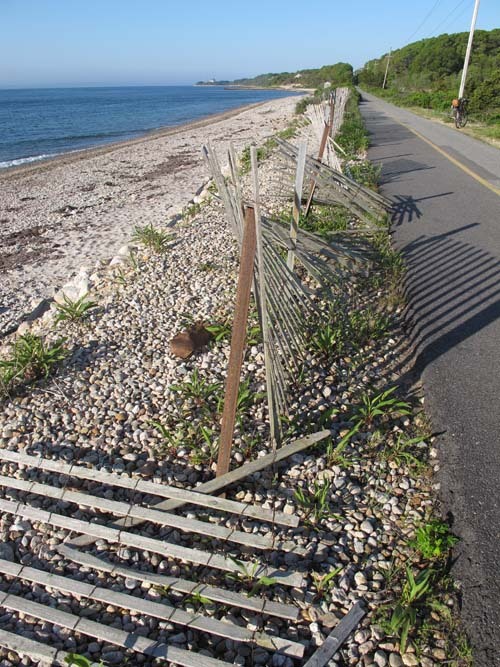 This entry was posted in Bike Path, Woods Hole by Salley Mavor. Bookmark the permalink. Ah Salley, thanks so much for sharing your morning with us. Such idyllic surroundings for an early morning ride. What a beautiful bike ride that was! I have never been to New England, but the more photos I see, the more I know I would love it there! Especially as I sag into a melted heap in the sweltering Georgia weather! 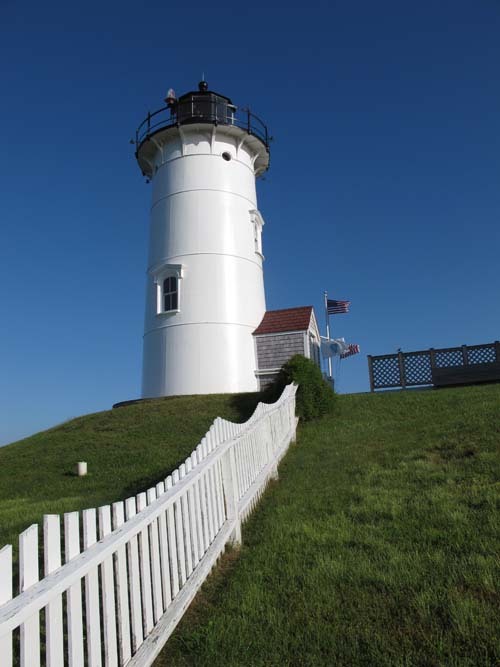 What a wonderful place to ride, I haven’t been to woods hole since I was a kid. I got out for a walk today, was windy, but a beautiful day to be out. It looks ABSOLUTELY GORGEOUS there! It does remind me of our coast here in the UK with the lighthouse and the little cottage. Really beautiful. I think I want a holiday in Massachusetts!! What gorgeous photos! And what an enchanting place! The weather in New England is very crisp and cool after that tropical weather we just had. 49* here this morning in southern CT! I love the shot of the fence and lighthouse, so graphic! I’m going to do a big swing through New England on my way from Virginia to Vermont in early August. May I stop by for a visit and see these views of yours in person? Salley, ‘Pocket Full of Posies’ inspired my latest blog post, if you are interested. Beth, thanks so much for writing such a gushing review on your blog! How lucky you are to be in such a picturesque area! I enjoyed the photos thoroughly.